There are over 30 species noted at Rio Grande Valley specialties, ie, birds found here that do not go very far into the US. During spring migration,we can observe many raptors migrating mornings from the Hawk Tower at Bentsen State Park. 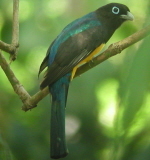 Many songbirds are easily seen at Quinta Mazatlan. Shore birds (red bellied whistling duck, etc. )are plentiful at Edinburgh wetlands, Estero Llano and Santa Ana NWR. Salineno is famous for the most amazing feeding station along the Rio Grande. Falcon State Park is sure to yield road runners, vermillion flycatchers, and many others. Green parakeets fly overhead in the Palmview McAllen area daily in flocks of 20-200.I can show you 3 monk parakeet nests inhabited by about 3o birds in Hidalgo. The Hidalgo pump House is another great birding spot. I also can take you to the Brownsville dump to look for the Tamaulipas crow and the Chihuahuan raven. Hiking, birding, dancing, traveling, reading. About 20 minutes from DFW airport. Several good birding areas nearby. I've been birding since childhood, and have taken advantage of living in California, Arizona, Florida, and Texas to amass a decent lifelist. I enjoy teaching field marks and helping others learn to identify species, and get into the field all times of the year in all weather. Birds, fish, herps, aquatic plants, travel, motorcycles, and any means of combining all of them into shared adventures. Intermediate birder with knowledge of south Austin parks and birding areas south of Austin. Enjoy birding and hiking. Austin has many green areas and is close to state parks and lakes with many opportunities for birding. I'm a beginning birder and am in bird language and would love to have someone to bird with. I have birded Texas and specifically the Gulf Coast off/on for 30+ years. I am a certified Texas Master Naturalist for the Midcoast section. We will bird along country roads bordering sod farms, ag fields, fencerows, rivers/creeks and bays to find your target species. There are several public hot spots where short walks are in order to find your target species. I'm knowledgeable of hot spots in Matagorda, Jackson and Calhoun counties and many adjacent counties as well. I am in central Texas but not to far from the coast (about 3 hrs max). Living in Aggieland makes this a great jump off point to many places all over the state. Pretty much anything on the upper Texas Coast and various other places around Texas. I have been to many places in this state and have fun birding them all. High Island and the Bolivar Peninsula I am very familiar with. I am an avid birder when time allows. My area is not very bird rich, although Texas as a whole is, especially in migration. I live in the Hill Country of Texas half way between San Antonio an Austin. In the spring I can usually show or tell people how to find the Golden- Cheeked Warbler and the Black-capped Vireo. Master's student from Central Texas attending TAMU. Been birding for years and am always looking for a reason to go. I am a member of the NWF and have numerous feeders, bird houses, bird baths and covered areas for my birds. I have only been watching in my yard for about 4 years, but I really want to go birding with someone. Have no friends interested in birding the way I am. I am located in South East Texas 40 Miles North of Houston, Texas. I live in the piney woods. Avid Birder, Photography Skills. Have some near extinct birds in area. State and National Forests abundant in the area. Know Texas Birds fairly well. I have enjoyed the hobby for many years and am excited each day to anticipate new arrivals. There exists many nice spots and opportunities to view birds in the area and I would sharing this opportunity anytime. I bird regularly in West Texas and in mid- and southern New Mexico. Also, I travel to SE Arizona pretty regularly to bird. I am a school teacher, so the "anytime" only applies to summers, Christmas break and Spring Break. The working year I am available on weekends. So,if you would like to bird the Chihuahuan desert, Bosque del Apache, Big Bend, or even look for the Tucson area specialties with me, please email. 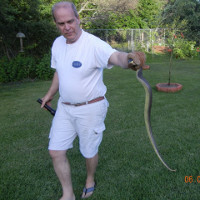 I am a retired teacher and a Certified Texas Master Naturalist. I have led groups on bird walks in several places including the Mission, Texas area. I have attended many expertly guided walks around the country, especially in the Rio Grande Valley and in southern Maine. I love to help folks, young and old, learn about birds and how to find them. I am in Hebron, Maine (near Lewiston) May 15 to mid-September and in Mission, Texas, Jan. 15-March 15. New to the area and somewhat new to birding. I am between Dallas and Ft Worth, TX. I consider myself a high-level amateur. Katy is on the South border of the famous Katy Prairie, an excellent birding area noted particularly for wintering waterfowl, passerines, and raptors. We are also near the Attwater National Wildlife Refuge. My wife and I have birded the Katy Prairie and the Attwater Prairie Chicken National Wildlife Refuge extensively. Killeen is located in Central Texas, home to a diverse mix of Eastern and Western species and local specialties including Golden-cheeked Warbler and Black-capped Vireo. I'm relatively new to the area but happy to show visiting birders around. White-Collared Seedeaters are often found in the Laredo area. Husband and wife duo to share the fun of birding in the Texas Hill Country--about one hour west of Austin, Texas. Local specialty birds are the endangered Golden-cheeked Warbler and the Black-capped Vireo in breeding season. Other fabulous birds are the Crested Caracara (also known as the Mexican Bald Eagle), the Scissor-tailed Flycatcher and Vermilion Flycatcher (again in the breeding season). Summers are hot so we usually try to escape the area for cooler climes. We have been casual birders for many years, planning trips around birding in new areas, but are becoming more focused on being better birders and are actively learning new species. We would rate our skills as moderate birders, but we will make sure to help you get on the birds and want your time in our area to be fun and fulfilling. Local hot spots include one national wildlife refuge (set aside for the Golden-cheeked warbler and the Black-capped Vireo), three state parks or state natural areas, a national fish hatchery as well as many other local neighborhood ponds and spots. Happy to help in any way we can. Located on the central flyway in the Texas Hill Country near Lakes LBJ, Marble Falls and Travis. About 1 hour west of Austin, Texas. Interests: Nature: birdwatching, photography, butterflies. Travel: stroll, walking, hiking, canoe. I'm new to the area, but settling in. Otherwise I can provide information for birders in the Abilene area or on the Upper Texas Coast. 40 years of birding exper. Would be willing to guide at Hagerman NWR & Heard Nature Center, near McKinney, where I partipate in bird banding. Also knowledgeable on Texas gulf coast & Hill country. I live on the edge of the country and work in a neighborhood area that also has farming around. I seen 1 American Kestrel an occasional Bald Eagles. Anahuac National Wildlife Refuge and Trinity River National Wildlife Refuge nearby. 20 minutes from Sheldon Lake State Park. 55 minutes from High Island. One of the premiere birding spots in the Dallas area is about an hour north on US-75 to Sherman, Texas then a few minutes west. The Hagerman National Wildlife Refuge, on the southern shore of Lake Texoma, hosts a wide diversity of habitats supporting a large number of avian residents as well as seasonally large numbers of visiting ducks, geese, and shorebirds. Access is easy, not extensive, and you'll get some good views of the lake and shore by driving the dike roads leading to the several oil drilling pads that jut into the lake. Plano is an urban area but close to good biring on Lake Texoma, Lake Tawakoni in McKinney at Heard natural area. San Antonio and its surrounding area has much to offer birders. Since I love birding this area, I also enjoy taking visiting birders around, so they can fall in love with it as well. Retired Air Force, 79 years of age, stroke victim, can walk after a fashion, love the outside. Back yard feeder photos watching. I live in the Rio Grande Valley of South Texas near the Mexican border. There are many birding hotspots nearby--Santa Ana National Wildlife Refuge, Estero Llano Grande State Park, Frontera Audubon Society Thicket. 2.5 hrs NW of Dallas, Wichita Falls is on Hwy 287 which would take you to Colorado. Not especially great birding area, but many of the common birds here are lovely. Lots of ducks and sparrows in winter. Oscar Carmona has been birding for 25 years, primarily in Texas and Mexico. He has lived in Texas all of his life and has spent countless hours studying the birds of this great state. Oscar is available to guide groups and/or individuals wishing to have a more personalized tour. I will also lead groups and individuals to Mexico as well. Please feel free to contact me for more information. My daily fees vary based on location within Texas. But usually fees run about $175/day. Howard was born and raised in Yorkshire, England, where his interest in birds and natural history developed from an early age. Before settling in Texas, he lived in Panama, Colombia, Venezuela and Brazil for a combined total of 17 years. His birding adventures have taken him from Alaska to the southern tip of South America, Europe, Africa and the South Pacific, and he has spent the equivalent of several years in the field. Howard has been guiding for a number of years and has organized and led bird tours in Texas and also to Bolivia, Brazil, Costa Rica, Mexico, Panama and Venezuela. One of his keen interests is the recording and study of bird vocalitions and he has built up an extensive collection of sound recordings. Howard speaks both Spanish and Portuguese fluently, and his language abilities, combined with his intimate knowledge of the region, allow him to travel in Latin America with ease. His company, Texas and Beyond, offers guided tours in Texas and to other destinations, including Mexico, Belize, Costa Rica, Panama, Brazil, Ecuador and Venezuela. Group rates are $ 200 – 250 per day. For more information about competitive rates for 1-3 personsContact him. Glenn Olsen has had a passionate interest in nature, especially birds, since early childhood. He has been involved with organized birding and conservation efforts in Texas since 1988. In addition to bird identification, he has a special interest—and continues his studies—in the relationships of plants, birds, butterflies, and other insects. As a member of the Houston Audubon Society, he has served as vice president of education and is an instructor for Audubon's Birding Classes. Glenn has also taught Introductory Bird Identification Classes at Rice University in the Continuing Studies Department and at Mercer Arboretum and Botanic Gardens. Since1993, he has been actively involved with the Native Plant Society of Texas and has served as State President. Glenn has been and continues to be involved with various birding, habitat, and native plant projects with many different organizations. 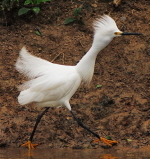 Through his guide tour company he leads birding and nature tours for groups and individuals. Glenn supports the conservation of habitat and educational programs about birds through memberships in the American Birding Association, Houston Audubon Society, Gulf Coast Bird Observatory, Texas Ornithological Society, Houston Ornithology Group, and the Native Plant Society of Texas among others. I also enjoy just helping visiting birders, and can email them with good birding sites, directions, places to eat and stay, migration timing, etc. My name is Greg Lavaty and I have been birding and photographing birds in Texas for the past 10 years with my main focus on birding in the Houston/Galveston area. I am familiar with all of the species in the Houston/Galveston areas as well as all of the commonly birded areas. Over the past several years I have gotten more and more involved in bird photography so my guiding is generally geared towards photographing the birds as well as finding them and observing them. My daily rate is $150/day for an 8 hour day for local trips in SE Texas. I will do trips state-wide and in northern Mexico. Availability is generally M-F, but I can do weekends if it is part of a longer trip.